While the popularity of edible flowers continues to grow among the American public, it needs to be tempered with a cautionary tale. Life among the flowers would be infinitely easier if all toxic flowers, like the Poison Hemlock or the Death Camas, carried names with poison in them, or at the very least, carried signs noting their toxicity. Because the probability of flowers providing overt warnings about their toxicity is very low, publishing lists of poisonous flowers remains the responsible alternative. 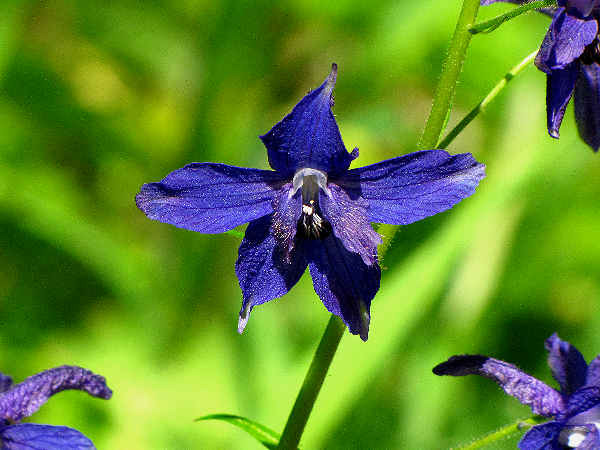 For starters, the list of poisonous flowers stretches as long as the list of edible flowers, and the poisonous species can cause health problems for animals, including dogs, cats and horses, as well as human beings. Learning how to identify poisonous flowers represents the first step in preventing accidental poisonings around the home. 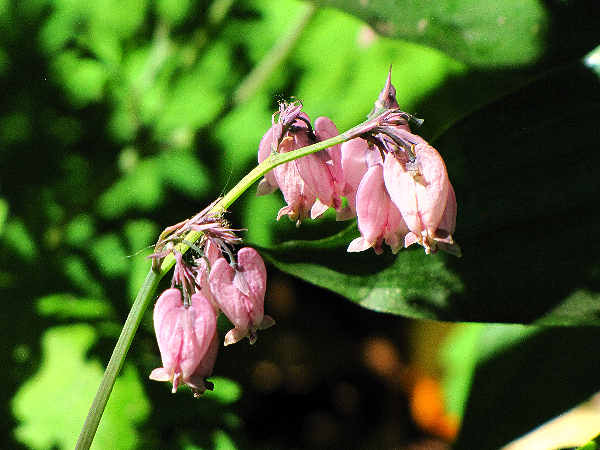 One need go no further than the holiday flower season to begin identifying poisonous flowers. Mistletoe and Poinsettia, for example, two common Christmas season plants, always make the poisonous plants list. The size and complexity of the lily family (Liliaceae) means it’s filled with both edible and poisonous species. Staying with the holiday flower theme, Easter Lilies sit atop the poisonous flower list. Veterinarians warm cat owners to keep their pets away from many popular house and garden species such as the Tiger lily, Easter lily, Rubrum, Day lily, Glory lily, Stargazer lily, Japanese show lily and Asian lilies. The picture shows the aptly named Death Camas, another species that ranks at the top of the toxic lily list. From holiday flowers to garden flowers, homeowners need to be reminded that all members of the buttercup family, Ranunculaceae, are suspect, although caution is recommended for more species than others, including Larkspur, Monkshood and Buttercups. 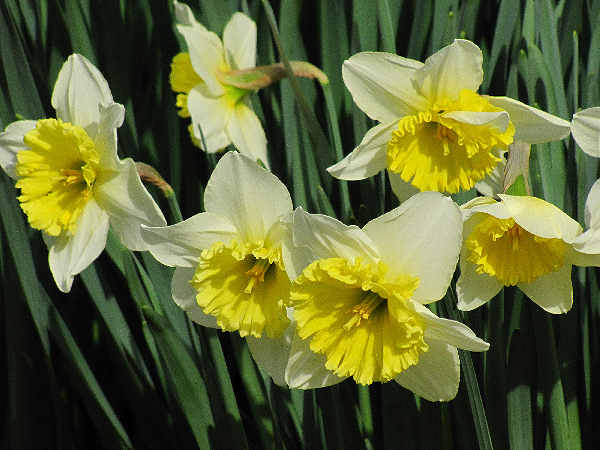 The bulbs and rhizomes of many species of popular garden flowers such as Daffodils and Irises also carry a toxic designation. The link to buttercups in the box on the right points to a page with pictures and information to help identify many buttercup species. The Pacific Bleeding Heart (Dicentra formosa), a Western plant, grows from Canada, south through California. Three different Fumariaceae genera are known as bleeding hearts. Plants in the dicentra genus, including the Pacific Bleeding Heart, are native plants that can be found throughout the United States. Plants in the genus Lamprocapnos, found only in the Eastern United States, are introduced species. Identifying Bleeding Heart can be straight forward. The plant usually grows less than two feet above the ground. The pink, heart-shaped flowers attract hummingbirds, and it is a good idea to leave the plant to hummingbirds because it is considered toxic to humans. 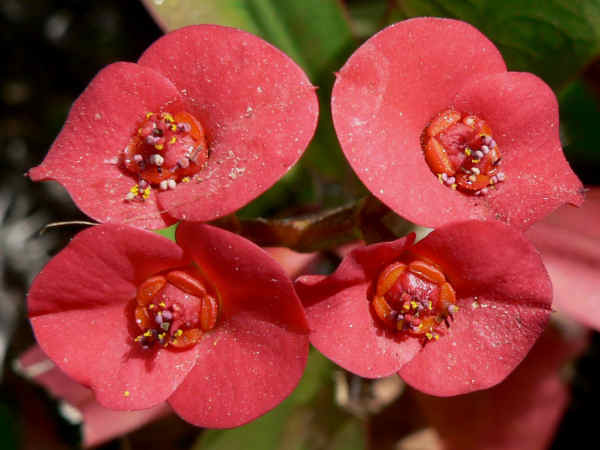 The brilliant red flowers of the Crown of Thorns (Euphorbia Milii), a thorny shrub in the Euphorbiaceae family, make it a popular flowering shrub in Southern Climates (USDA Zones 8-11). It also grows well in a container. Caution is advised when caring for the plant because the sap is poisonous. Approximately fifty different native Euphorbiaceae species, most with the name spurge, grow across the United States. The Poinsettia, another non-native species, is perhaps the most well known of the red flowering Euphorbia. No discussion of poisonous flowers can be complete without mention of the major poisonous non-flowers plants. Keeping safe in the back yard as well as the greater outdoors also requires some basic knowledge regarding North America’s most common poisonous shrubs, specifically the five native shrubs in the Toxicodendron genus of the sumac family. The picture provides a good start for identifying any poisonous oak. 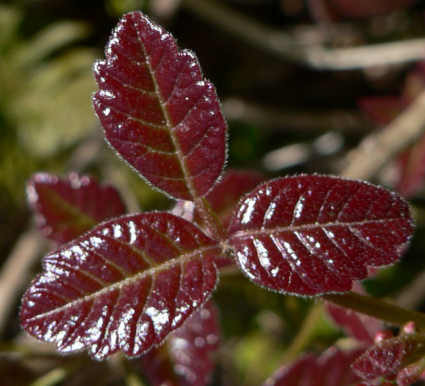 It highlights the plant’s three rounded, lobed and red (or green) leaves. A hardy grower in many geographical regions, most parts of the plant, including the roots, stems, leaves and fruit contain an oily sap that attaches to, and quickly irritates the skin. Home remedies for Toxicondendron contact abound, the best remedies start with avoiding the plants. In case of contact, many experts cite the importance of immediately cleaning the area with cool water and using some type of mineral oil to attempt to remove the sap. In instances where skin irritations such as itching and blistering occurs, experts recommend topical treatments of Hydrocortisone or the basic standby Calamine lotion. Poison ivy grows in mosts environments, and as almost everyone who has come in contact with the plant knows, its oily sap, urushiol, causes rashes upon contact with skin. Less well known is the fact that the oil can remain on many objects including clothing, shoes and the family pet, causing secondary skin irritation upon contact. 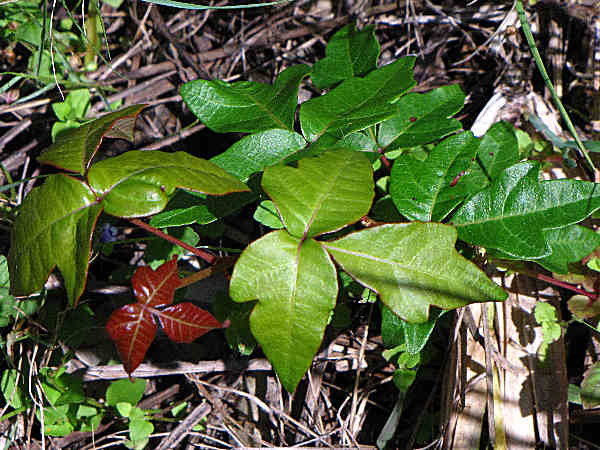 Preventing the itches and pains doled out by poison ivy often begins by identifying the plant and avoiding it. Technically, two species of poison ivy grow in the United States. Identification starts with the plant’s three leaves, which are situated on a woody stem. Normally poison ivy grows low to the ground. However, it also grows as a vine or shrub, which can place it well above ground level. The stem can be red or green. Leaf color can change from shades of red to green to red during the spring, summer and fall. Often the two outside leaves have notches, giving them the look of a mitten. In case of contact, many experts cite the importance of immediately cleaning the area with cool water and using some type of mineral oil to attempt to remove the sap. In instances where skin irritations such as itching and blistering occurs, experts recommend topical treatments of Hydrocortisone or the basic standby Calamine lotion. On a final note, the idea that consuming poison ivy leaves serves as either prevents or cures skin rashes has been around for well over one hundred years. Today, over the counter pills containing urushiol extract are marketed as a poison ivy preventative tool. The Food and Drug Administration does not accept such claims. However, the FDA does recommend topical lotions with the active ingredient, Bentoquat, as a poison ivy deterrent.